Nokia today announced the next stage in its plans to introduce unique Lumia experiences to more people around the world. The new Nokia Lumia 610 is Nokia's fourth and most affordable Lumia smartphone, designed as the perfect introduction to Windows Phone for a younger audience. The Nokia Lumia 610 makes it easy to keep in touch with friends, providing instant access to social networks and bringing all mobile, email, Facebook, Twitter and LinkedIn contacts into one place. It also makes it easier to browse the Web with Internet Explorer and to access games through Xbox Live. Available with Nokia Maps, Nokia Drive, Nokia Transport and Nokia Music, people can also choose from thousands of apps in the Windows Phone Marketplace to further personalize the experience. With a distinctive profile and finely beveled metallic edges, the Nokia Lumia 610 is built to convey both quality and aspiration. 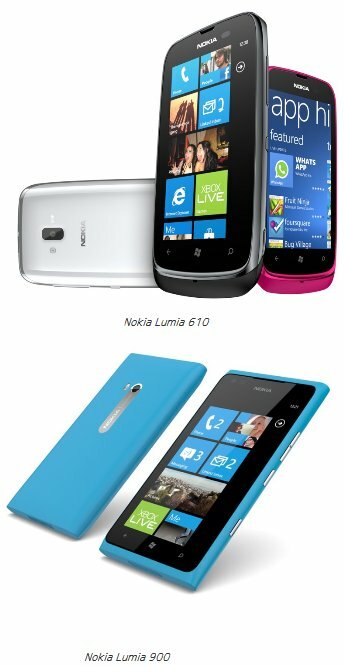 It comes in white, cyan, magenta and black, is priced at EUR189 and is expected to begin shipping in the second quarter of 2012. The Nokia Lumia 610 was made possible thanks to a new software release from Microsoft delivering enhanced capabilities to the Windows Phone 7.5 platform. The software release, available from April optimizes Windows Phone to support lower memory and processor requirements, while still delivering the same great experience for more affordable products. In addition, Windows Phone will now include the network and language requirements for China. As a result, Nokia announced plans to make a range of Lumia smartphones available in China, covering both CDMA and WCDMA technologies, in the coming months. After launching the Nokia Lumia 900 as its first LTE smartphone, Nokia is also making the phone available around the world in a DC-HSPA variant, for high speed data connection (42Mbits download) in countries where LTE is not available. The Nokia Lumia 900 features a 4.3 inch ClearBlack AMOLED display for a superior touch and viewing experience. It also features Nokia's highest capacity battery making it the perfect Lumia phone for enjoying media and entertainment on the move. The primary camera on the Nokia Lumia 900 has exclusive Carl Zeiss optics, a large aperture for improved performance in low light conditions and wide angle focal length for capturing full 16:9 images. It is also the first Lumia phone to feature a front-facing camera, with large aperture and wide-angle lens for sharp, bright images and video calling out of the box. - Nokia Reading is the next milestone in Nokia's strategy to offer a comprehensive entertainment experience on Lumia. Nokia Reading provides a single, integrated hub experience, leveraging a panorama design to make it easier and faster to enjoy news, ebooks and audio books, including the ability to access content offline and pin dynamic content to the start screen as a Live Tile. With an emphasis on local language materials wherever it becomes available, Nokia Reading delivers a highly personalized and locally relevant service. Future updates will include the ability to build dynamic magazines from feeds for a single integrated view of favourite online content. With no sign-in or subscriptions, Nokia Reading will be available from April. - Nokia Transport, coming to Lumia for the first time, provides convenient door-to-door, underground, tram, suburban train, and bus directions for over 500 cities across 46 countries. With step-by-step directions to the nearest station as well as timetable information on when the next bus or train is arriving for more than 80 cities, Nokia Transport will be available to download from the Windows Phone Marketplace in March. - A new update to Nokia Drive, the free voice-guided, turn by turn navigation app that turns any Lumia smartphone into a personal navigation device will provide full offline use and features speed limit alerts. The update will also be available to download from the Windows Phone Marketplace in March.